Japanese Episode 236: "Akai Gyaradosu no Ikari!" English Episode 527: "Rage of Innocence"
As the Red Gyarados is being transported to Chouji Town, Satoshi-tachi struggle in their jail cells. Musashi-tachi visit to taunt the twerps, but they innadvertedly set them free. Musashi-tachi chase after them, but they are stopped by Wataru and his Kairyuu. After the Rocket-Dan flee, Wataru commands Kairyuu to destroy the laboratory containing Shiranui-Hakase's evolution machine. 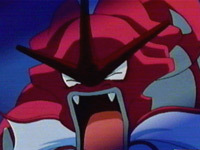 Meanwhile, the Red Gyarados awakens en route and is able to free itself from the rest of the Rocket-Dan. As they work to contain the pokemon, Satoshi-tachi arrive to stop them. Wataru battles with Tatsumi while Satoshi-tachi keep Musashi-tachi and the Rocket-Dan grunts from recapturing the red pokemon. Tatsumi is eventually defeated and taken away by the police while Satoshi pleads with the Red Gyarados to trust him. The pokemon is about to attack Satoshi-tachi, but it is stopped by a Jugon's Freezing Beam. Satoshi thanks the Jugon's trainer and hurries off to reunite with Wataru. Wataru decides that the only way to stop the rage of the Red Gyarados is to capture it, so he does just that. Wataru promises to treat the pokemon like his friend, so a satisfied Satoshi goes off to challenge the Chouji Town Gym Leader. Part Two of the Red Gyarados saga is here, and while I have some problems with it, the good outweighs the bad. The only thing I wish they had done differently was not focusing on Satoshi-tachi that much, since in the end they really didn't do as much as Wataru. And what was up with the idea that two helicopters and a net would be enough to contain a Red freakin' Gyarados? What WAS Tatsumi thinking!? Well, in this episode, Tatsumi's (who has apparently been renamed "Tyson") voice isn't quite as bad as it was in the last episode. This time, Lance stuck out as having the worst voice. It just doesn't sound right for the character at all, and the fact that he seemed to be given the most cornball lines in the episode ("put the petal to the metal!") really didn't help. Dr. Sebastian (who just mysteriously disappears a third of the way into the episode) sounds the same, meaning he has that same stereotypical Disney villain voice. And finally, we get to hear Pryce's dubbed voice, who has the exact same voice that I figured 4Kids would give him. Please, 4Kids, hire some more voice actors. I'm tired of being able to predict what each character will sound like long before they appear. Here's something rare--a cut that isn't the result in 4Kids placing the commercial break in a different spot in the episode. You know the part where Satoshi uses his Bayleef to cut the rope the Rocket-Dan grunts are using to pull the Red Gyarados out of the water? Well, when the rope is cut in the American version, we can see the cars kinda bump into each other, but that's about it. In the Japanese version the scene's a bit longer. We actually get to see the jeep on the left side of the screen turn over and the Rocket-Dan grunt get thrown out of the vehicle. I guess Kids' WB! thought that it was "too violent" or whatever, so they cut it out. Bastards.